1. We'll use ordinary pasta dough for our ravioli. Jerry likes the 1-2-3-4 approach: 1 teaspoon of salt, 2 tablespoons of olive oil, 3 eggs and four cups of flour. You can roll it out with a rolling pin, taking pains to get it uniformly thin. Or you can use you pasta machine to crank out long belts of dough. 2. At this point you've got two more choices: hand-cut ravioli or ravioli made from the little mold forms that look sort of like ice cube trays. 3. If you're going hand-cut, then size becomes another issue. You can make the traditional 1 1/2" squares or a larger square twice that size. Our only comment is that a really chunky filling make require a little more space. 4. 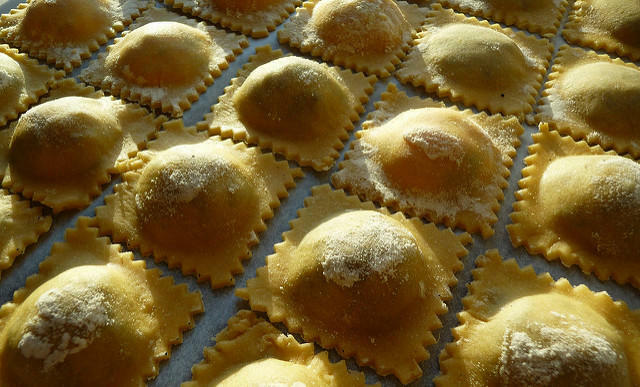 There are lots of videos on-line that can brief you on ravioli making, and all of them will leave you feeling, correctly, that it's really easy. *It's best to pre-cook your ingredients; the ravioli only cooks for 3-5 minutes and that may not be long enough to cook it all through. *If, however, an ingredient tastes better raw, use it raw; otherwise cook it to bring out its best flavor. *Chances are you're going to want to briefly blitz your filling in a food processor; a second or two will probably get the consistency to where you'll want it. Otherwise, the filling may be awkward to work with. *Avoid too much liquid in your filling; drain well before stuffing. 6. Most fillings are combos, a little of this and a little of that. There are hundreds of natural partners and here are a few: butternut squash and crumbled pecans; spinach and ricotta cheese; ground lamb, onions and rosemary; crushed tomatoes, diced peppers and goat cheese; mushroom and sun-dried tomatoes; lobster and crab in a spicy feta cheese sauce; and any combination or two, three or four cheeses, provided at least one of them melts well. 7. For this spring season, how about using ground lamb, mid-eastern spices, garbanzo beans and fresh parsley? Or how about asparagus, slivers of country ham and garlicky mayonnaise? 8. Here's a few other tips. Once the pasta has been rolled out, work quickly and keep any unused portions in a plastic bag or under a moist tea towel. You can use egg white to seal the layers of ravioli but plain old water brushed on works just as well. Try to gently squeeze the air out of the little ravioli bubble before cooking it. Use a fluted crimping wheel to further seal the edges of each square of pasta. And it's best to use a slotted spoon to gently lift the ravioli out of the hot water. 9. When it comes to sauces, again the sky is the limit. I prefer a simple broth of some kind with larger ravioli. But any variation of tomato, cream or cheese sauce will find a home. Just think about flavor compatibility. You probably don't want the sauce to be more flavorful than the star ingredient of your filling.